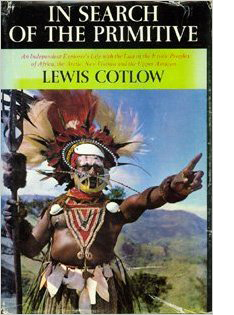 Lewis N. Cotlow (1898-1987) was an explorer, author, and filmmaker whose popular documentaries the historian Amy J. Staples described in the journal Visual Anthropology (2002) as an example of "the popular ethnographic imaginary of mid-century America." Cotlow made photographic expeditions to Africa, South America, Indonesia, and the Arctic from the 1930s to the 1950s. Some of his movies were widely distributed, such as Savage Splendor (RKO, 1949), the first Technicolor feature film shot on location in Africa, which he co-produced with wildlife photographer Armand Denis. Although Cotlow spent much of his career as an executive of the Massachusetts Mutual Life Insurance Co. in New York City, global exploration was his love. He attended GW in 1919, but then became the youngest supercargo, or ship's businessman, in the American Merchant Marine. He made more than 30 expeditions to all parts of the world, using as his scientific rationale the need to document "primitive" peoples before they disappeared. Lacking formal anthropological credentials, Cotlow presented himself as a sort of folk anthropologist who had a natural rapport with exotic peoples that enabled him to visit places and film rituals that others could not. He also collected ethnological specimens for museums. Cotlow joined the New York-based Explorers Club, whose flag he carried on expeditions to the Amazon, Africa, Australia, and New Guinea between 1940 and 1969. This group later awarded him its highest honor, the Explorers Club Medal, previously bestowed on such famous people as Admiral Robert E. Peary and the Apollo 11 astronauts. This medal honors those who make "extraordinary contributions directly in the field of exploration, scientific research, or to the welfare of humanity." In 1977, Cotlow also received the Order of Magellan, the highest honor of the Circumnavigators Club, reserved for "outstanding individuals who are dedicated to advancing peace and understanding in all parts of the world." "For contemporary audiences," writes Staples, "Cotlow's films may appear staged, campy or blatantly racist; however, in their time they were billed and consumed as anthropological documents with educational and scientific value." Cotlow died in 1987. He had directed that $150,000 of his estate be given to one of the colleges he had attended, with his executors choosing the institution that seemed most likely to make optimal use of the funds. In 1989, the executors contacted Suzanne L. Simons, the GW Anthropology Department chair, who responded with a proposal to spend income from the endowment on fieldwork. When they selected GW for the bequest, the executors said the deciding factor was the Department's commitment to exploration and field research. Cotlow bequeathed the bulk of his artifact collection, along with his films and many photographs, to the Cincinnati Museum of Natural History.